Here is the Tribune for October of 2012. Enjoy. 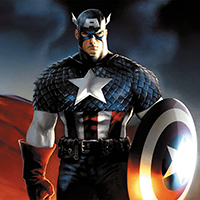 Captain AmericaThe winner of the PoTM award is Captain America! Captain America has been in 1st place but is now in 3rd place. Captain America is on Earth 1 and is in the alliance AI. Captain America is a warrior with almost 20,000 unit kills and only about 3,000 units lost at tick 1000. You do not want to get on Mr. America’s bad side, he has already fought many alliances and is still on top. The best of luck to you Captain. AIThe alliance of the month goes to AI. AI is currently the number 1 alliance in E1 with 1 relic. They are located in southern Africa but their empire includes all of Africa, parts of Europe, Asia, Australia, and western Antarctica. They are an aggressive bunch and have many enemies but they still remain on top. They are currently at war with TBB and allies so good luck guys. QBThe alliance of the month for October 2012 is QB (Quarterbacks) on Mars 2 era 30. Mars 2 has had a very competitive era where there have been 5 very powerful alliances (MW, QB, CoF, M and LB). QB have done extremely well to be on top of this era. They looked comfortable in 2nd with MW having a comfortable lead on top of them. However, QB has recently been to war against MW. Despite having a disadvantage in terms of power, it looks as if QB are soon to finish them off due to their outstanding coordination. QB have won some outstanding battles throughout the era, such as destroying 115 MW squads in one battle, thus showing that their coordination and battle skills are amazing! However, QB still has a rather difficult task ahead of them. Despite having (at the time of writing this) 8 of the relics, there is still one more huge threat in the era, which is M.
QB has shown great diplomatic skills and has been able to get the relic that was given to them. QB also has a huge amount of territory covering over a quarter of the map! Considering that this very competitive era, accumulating so much territory is a great success! QB also has an outstanding amount of crystals currently standing at over 250 and increasing rapidly. QB has also been able to dispose of another super power early on the era; IA, who had a significant power advantage over them. QB don't have long to go before they find themselves victorious however they must hold the relics off as past enemies may still return for their revenge. QB has been together a long time and are beginning to show that they are a very difficult team to beat! Conquering Menstrual has put together a very strong team who look difficult to beat. Only time will decide the fate of QB. However, for their amazing start to the era and their outstanding victory over MW, they are being named October Alliance of the Month. Congratulations! LordcummingThe player of the month is Lordcumming from Mars 2 era 30. Mars 2 has had a truly exciting, era with multiple players fighting for the top rankings. However, during these times, Lordcumming has always been in the mix and has now taken a clear lead and is likely to sustain it. Lordcumming is currently ranked 1, and mars 2 is set to enter its final stages soon. Lordcumming has been an outstanding player this era and a great addition to QB. Especially to their expansion capturing over 300 outposts which is extraordinary! Lordcumming is also one of the most powerful players in the era with his power standing at over 170, and considering how QB had just been in a war to decide the fate of the era, this is truly impressive! Lordcumming is also a great player on the battlefield, so rest assured that his army isnít just there for show. He has competed in over 500 battles, and has won most of them! He has destroyed over 10,000 units, and conquered over 100 players, which are terrific achievements as well! However, one achievement outshines them all, and that is the amount of crystals he has been able to collect this era, which stands at over 200! That is over 100 more crystals than anyone else in the era! Lordcumming has played extremely well this era and his stats clearly show he deserves the victory and the award for Mars Player Of The Month. Good luck for the rest of the era and Well Done! THE WHOThe top player this month comes from Galaxy 1 era 21. THE WHO has been showed a great use strategy, leading ATP to the win. He is the rank 1 player this era with a power of 351 and a score of 6370! Congratulations and good luck! AK47The top alliance of this month is AK47 (Am3rikan K4rtel), from Galaxy 5 era 10. LUZ is currently leading AK47. This alliance was chosen for the alliance of the month due to the power and strategy displayed in this era. They have two times the amount of power of the rank 2 alliance, and quadruple the rank 2 alliance's score! AK47 has also won 3 eras in a row at G5. Very good job and good luck guys. TIP #1Don’t hesitate to ask if you have a question. Don’t be afraid to ask people on your chat or in the forum if you have any question. Never fly blind and never stop seeking advice. A lot of players will help you out because we all are seeking new friend and future top players. Everyone was trained in the beginning and nobody has all the answers. Newbs and Veterans ask questions all the time regarding game play and updates, so you aren’t alone. TIP #2Send spam messages to all players in an enemy alliance you want to attack. No one can resist opening a message. This will give you a gauge as to who is active and how active are they. You can use this probing to determine if your assumptions to his sleeping habits were correct. Though to counter this, sometimes people go into radio silence or they wait a few days and open it at odd hours; to avoid people knowing if they are online or not. Also most players use the same in-game avatar that they have in the forums, sometimes just being active in the forums will help you to know what the username is for your enemy and you can see if they are online or not in the board index. TIP #3Markers are little notices ingame to help you and your alliance members communicate. They can be created by anyone in your alliance and are only seen by people in your alliance. Only the leader and minister can edit/delete markers. Placing markers to help in coordinated attacks can help better organize your attack. Also when you are in a big battle keeping up with big army’s and the scans of those big armies can help save you and your alliances energy. Also having a set sign for a set order or information can keep information better organized and more eye catching. I will keep it short and sweet this month. My primary purpose for writing this article is to simply encourage everyone to become part of this community. We rely on you players to be the bond that holds the game together, and being social and using diplomacy is a huge part of this! So please, hang around the forums a bit. Check out what it has to offer! If you already use this forum, Great! Just try to pull one or two other people in too! There are a lot of reasons why the forum is a great place if you play BattleDawn. You can network here and potentially find alliances to join, or a mentor to help you learn the finer parts of the game! You can post up in the Alliance Recruiting board an appeal for members for your own alliance. You can debate any issue (within appropriate common sense boundaries of course) debate any issue you wish until your heart's content. We have some REALLY good debaters around here, who would love to have the activity! There are also a lot of exclusive things that happen here, such as deep discussions on game updates, or contests in the Spam board which can occasionally net blue tokens! The fact is though, that if you do not come here and hang out, you would not even know these things were happening! So, come and be an active part of the community! Come and show us who you are, and see who we are! You won't regret it. This month, I would like to formally thank a few people. Dawnice, you are a HUGE help to me and to all of us. I do not know if you know how much we rely on you, but we do in many ways. Thank you so much for all of your efforts! If I could, I would hug you =) I cant do that though, so instead you were promoted to Senior Moderator. Congratulations! Elric & Tom, you have been stepping up your game lately. I appreciate that you guys are putting in more effort, and revamping the Maintenance Team. Keep it up! Michael, Liran, Julius & Eran, you guys RAWK! You have been doing a great job of keeping on top of fixes and concerns. I know you guys do more than I could ever list here. On behalf of the community and administrators, Thank you. You know you're addicted to battledawn when you build a mana shrine in your sand castle. You know you're addicted to battledawn when you're paranoid the mars rovers will find your colony. You know you're addicted to battledawn when your friend suggests something and you say no naturally. You know you're addicted to battledawn when you find a tick trying to bite you it reminds you to check your world. You know you're addicted to battledawn when you type in your colony coords on google maps. Eh, I try to win every once and awhile. Gotta keep up appearances. Funny!!! I liked them very much. You got a problem, I can fix it!